I have finally completed my Shelfari social media group. 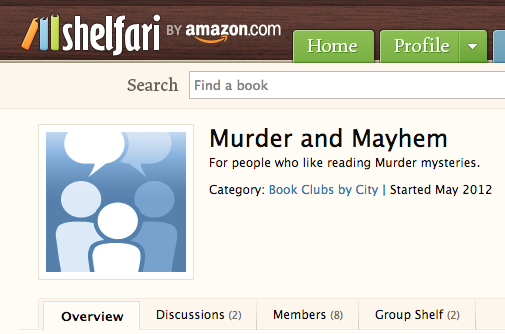 It's an online book club called Murder and Mayhem. To complete Task 2 I learnt how to take screenshots. I found a helpful tutorial video on the Teachers Toolbox for Educators wiki that showed me how to take a screenshot using my Mac. I didn't know how to reference my screenshots so I posted a question to the unit discussion forum and my tutor advised that screenshots are actually photos I take, so I am the copyright owner of the screenshot. She said I don't need to reference my own work, but that it is always a good idea to include hyperlinks back to the page where I took the screenshot as this will add interest and credibility to my blog posts. If you move your mouse over the above screenshot of my Murder and Mayhem page on Shelfari you can see I have included a hyperlink to the group about page. I did a Google search "how to add a hyperlink to an image" and found the Weebly Help Center page with instructions for creating links on text or images. It was so easy! I just clicked on the image to display the image options box (shown below), then on the Link option and then pasted the URL for my Murder & Mayhem page into the website URL textbox. This is an example post for review purposes. Use the Task 2 marking rubric to identify which blog criteria this post meets. Task 1 was a real struggle at times. When I couldn't figure out how to do something on my website I searched the Weebly help and was usually able to find the answer. For example: When I couldn't figure out how to create a hyperlink, the help information explained I needed to select the text and then click on the "chain icon" and paste in the URL for the website I wanted to link to - problem solved! Although I made a few mistakes along the way and spent quite a few hours trying to fix them, I’ve learnt that where there is a will there is a way! Completing this task I learned new skills such as; how to create a website and blog using Weebly and a poster using Piktochart as well as how to add hyperlinks and images into my website. I have also gained new knowledge about safe, responsible and ethical use of ICT when working on the Internet and a basic understand of the principles of authentic learning. I know I will be able to apply some of these skills to my other studies and I hope to be able to teach these new skills and knowledge in my future classroom and empower my students to be creators and safe responsible digital citizens. I’ve spent a bit of time reading the textbook. In chapter 1 Howland, Jonassen and Marra (2014) explain tasks are "meaningful when they require intentional, active, constructive, cooperative and authentic learning" (p. 3). I found the attributes of meaningful learning very interesting and I am curious to learn more about how to implement meaningful authentic learning in the classroom. In the first lecture this week we discussed Authnetic Tasks and how this will benefit us, and our students in the classroom. Giving students more choices about what and how they learn encourages them to be more self-directed learners and will help them become better problem solvers. In the second lecture we discussed what we need to do to complete task 2 and brainstormed questions. Task 2 is about using social media and we will present all our work on the website we created for Task 1. First we need to select a social context and think about how we want people to contribute to our social event, situation etc. Then we need to find a social media platform that will support our social event. Finally we need to create multimedia instruction to tell our peer reviewer how to access our social space and what to contribute to it. I really like reading murder mystery books so I thought it might be un to create an online book club to share good books and authors with other murder mystery fans. The tutor suggested we look at the Symbaloo social media tools link on the Technology Toolbox for Educators website, Social media & networking page for some ideas about social media technologies so I'm feeling much more confident about Task 2. Now I'm off to discover what Shelfari and Goodreads have to offer to see which is the best technology for my site. Wish me luck! Howland, J., Jonassen, D., & Marra, R. (2014). Meaningful learning with technology (Custom Ed.). Compiled by Herrington, J., & Parker, J. Upper Saddle River, NJ: Pearson. I have finished creating my website and blog for Task 1 so this week I have been looking at other students websites and blogs. For Task 1 we all had to create a website, blog and a poster about a topic related to safe, responsible and ethical use of ICT. 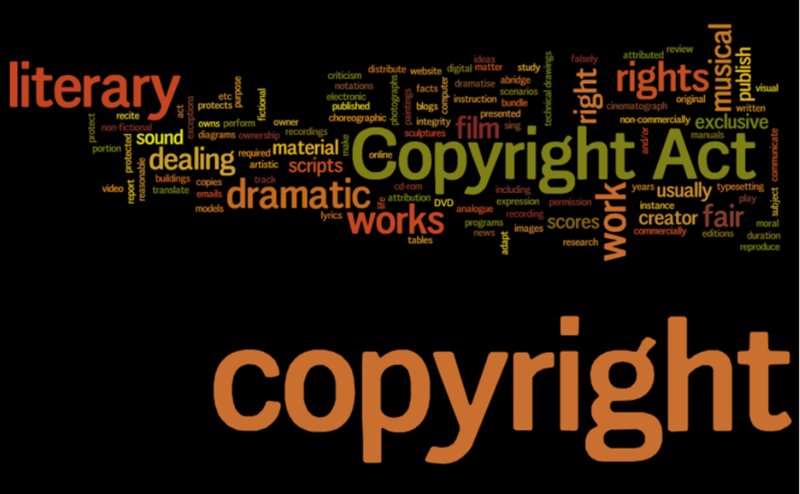 I decided to do a poster about Best Practice for Attributing Creative Commons Images as I feel ethical use of others work is a very important skill that I need to know so that I can pass it along to my future students. Reading other students blogs it was obvious that many people have never created a website or blog before so we are all in the same boat! I don't feel so alone on my learning journey. Wow, some students have done a fantastic job. I was very impressed with what everyone has produced in such a short time! Comparing my own Jimdo blog with the different tools other students have used I noticed that different blog technologies display or don't display various features. For example: In my Jimdo blog I can't see an archive list on the side of the page like you can see on Blogger or Weebly blogs. Also, if I post a long blog with images a read more link is displayed. When I click on the link it displays the entire post in a separate page, but then I can't see any way to navigate back to the main page except by clicking on the Blog link in the top navigation. This makes it awkward to move back and forward through my blog posts. I did a Google search "Jimdo + create blog archive" and found some information about creating a blog archive. However, looking at the instructions, it appears you have to manually create a new page for each year. Maybe I'll look at changing to an external blogging technology so I can explore the full features offered by a real blogging platform. I also noticed that I could not add comments to students blogs who used WIX or Google Sites. I did a Google search "Wix blog comments" and found some information on the WIX help center. It appears the comment box is not automatically displayed and this page provides instructions for how to customise your comments box. I wonder if the students who used Wix blogs know this? Maybe I should post a message on the LMS discussion forum. Another Google search for "Google sites comments" revealed that comments on Google sites can only be done by the owner or editors - not vistors. Commenting on others blogs is a major component of blogging, so it appears the Google Sites in-built announcement page is not the best tool for a blogging. I think if I was going to ask my students to build a website using Google Sites, I would probably suggest they use Blogger for their blog platform. From the comments I've read about Blogger is seems very easy to use and would provide the opportunity for other students, teachers and parents to comment on my students work. Well that was easy - it is exactly the same process as adding columns and photos in a Jimdo webpage. Make sure you click on the save buttons. Click on the blog post heading and select Publis to display the post. I have never created a blog before. I thought it would be very difficult and that you would need some programming skills, but with Weebly it was very easy. I just created my account, then followed the on-screen instructions for creating a website. All went well. Then all I had to do was drag the appropriate element onto my page to add text or images. I used the picture element to add a picture to my home page. I added a new page (clicked on the pages tab) and selected the "blog" type page to create my first post. I had a quick glance at the information on the Technology Toolbox for Educators >> Web page and the article "Simple ideas for website design" caught my attention. It provided some great hints for beginners about website & web page design, so now I'm going to add another page to add some information "about me" so that visitors (hopefully my peers) can send me feedback throughout the semester. In this unit I are required to write regular blogs posts throughout the semester to reflect on our learning. I've never written a blog and was unsure about what to include. Luckily the unit includes some blog guidelines! Humm, well I've already mentioned my learning and problem solving strategies above and now a little about the content and my feelings. And as you can see I've also added some hyperlinks!